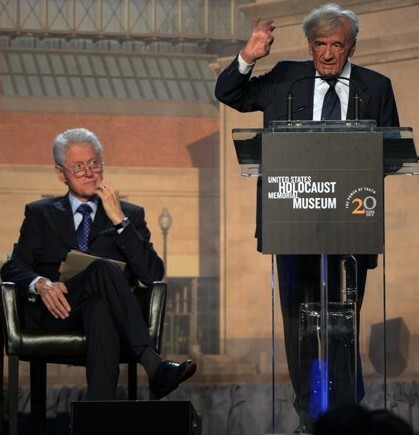 Former U.S. President, Bill Clinton and Holocaust survivor and Nobel Peace Prize laureate, Elie Wiesel marked the 20th anniversary of the U.S. Holocaust Memorial Museum yesterday and honored over 800 Holocaust survivors along with 100 military veterans who helped liberate Europe. On April 22, 1993, the same two men spoke at the dedication ceremony of the U.S. Holocaust Memorial Museum and in his speech, Mr. Wiesel publicly urged then President Clinton to help stop the war in the former Yugoslavia by saying "What have we learned? We have learned some lessons, minor lessons, perhaps, that we are all responsible, and indifference is a sin and a punishment. And we have learned that when people suffer we cannot remain indifferent. And, Mr. President, I cannot not tell you something. I have been in the former Yugoslavia, last fall. I cannot sleep since for what I have seen. As a Jew I am saying that, we must do something to stop the bloodshed in that country!" Twenty years later, Mr. Clinton recalled that in 1993, Mr. Wiesel took him aside after the dedication ceremony of the museum and told him in "very eloquent language" to "get off of my rear end and do something about Bosnia." Not long after that, Clinton sent an emissary to the region to explore peace talks in what he said was a "drive by Jews of conscience to save the lives of European Muslims." In the last twenty years, over 35 million people have visited the U.S. Holocaust Memorial Museum that strives to preserve the memory of the millions of Jews who died at the hands of the Nazis. On April 29, 2013, former President Clinton and Nobel laureate Elie Wiesel called on the world to stop future genocides from happening. "For the dead and the living we must bear witness" said Wiesel. Former President Clinton added that "Make sure that as direct memories fade away, that the records, the pictures, and the stories never die, to make sure that we will always be able to come here to remind us that no matter how smart a people are, if you have a head without a heart, you are not human." ACBH is very grateful to all of those who spoke up and continue to speak up against injustice and intolerance and praise the U.S. Holocaust Memorial Museum and the Center for the Prevention of Genocide for their important work in preserving the memories of those who died in genocides past, including the Srebrenica genocide, and for being diligent in their quest to prevent future genocides from happening around the world.